Welcome to the second post in the series Royal Wedding Wednesday A Lovely Carriage Makes for a Lovely Marriage. Today we will cover how non-royal and royal brides arrive to and leave after a royal wedding. 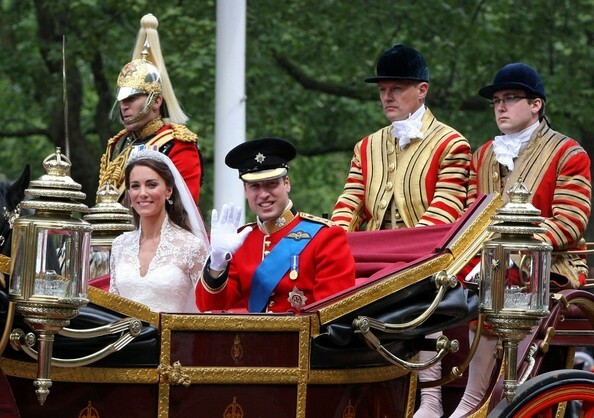 When the Duchess of Cambridge married the heir to the throne, Prince William, she broke with centuries of tradition and arrived at Westminster Abbey in a car versus a horse-drawn carriage. But thankfully the happy couple left the wedding in a beautiful carriage. The Queen’s Golden Jubilee 2002 Bentley. Other Rolls Royce’s, including the Phantom IV. This was the car used when Sophie Rhys~Jones married Prince Edward in 1999. Cars can indeed be quite lovely and elegant. Princess Grace not only arrived at her wedding in a car but also left the church in a Rolls Royce. Her wedding to Prince Rainier of Monaco was truly one to remember. Carriages and coaches are very expensive to maintain. A carriage is open and generally has one driver. A coach is generally closed and the team of horses is controlled by coachmen. The back of the coach is attended to by footmen. Besides the restoration work that many of the antique carriages require, the Queen’s horses, Windsor Greys, are also quite costly to keep. 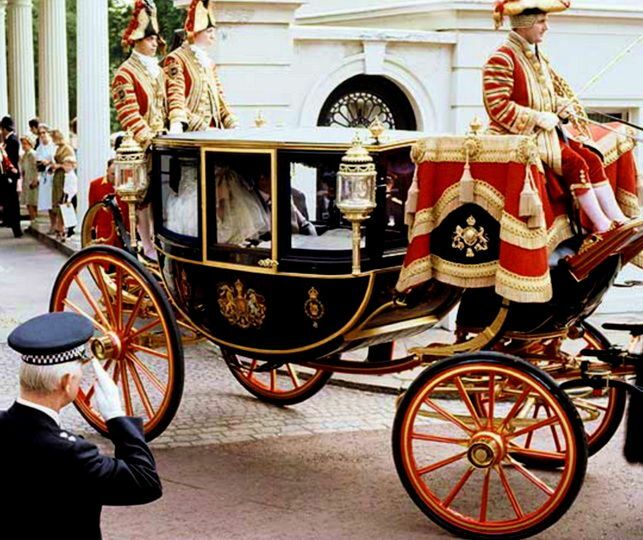 The Queen is shown here in an Ascot Landau Carriage. 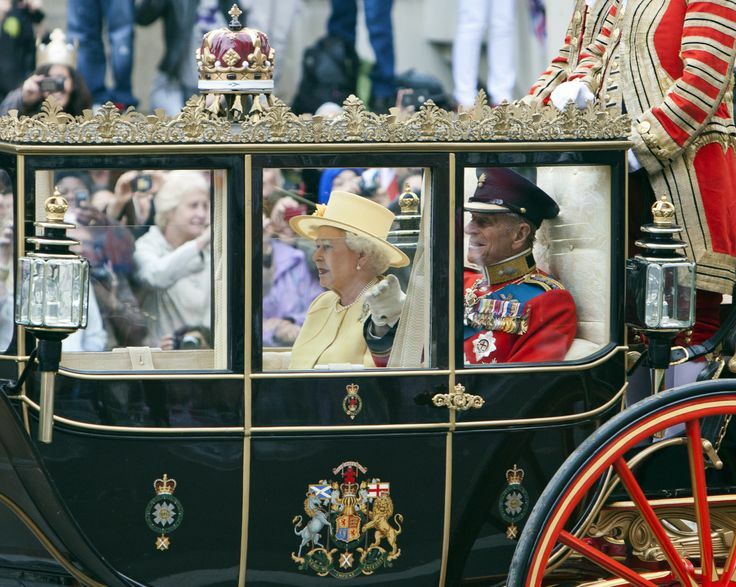 When entertaining heads of state and for the opening of Parliament, the Queen often selects the Australian State Coach. It was presented by the Australian people on the occasion of the Australian Bicentennial in 1988. It was built by W. J. Frecklington. The coach is quite modern in that it features heating, electric windows, and hydraulic stabilizers. A newer, similar coach is the Britannia coach. The black and gold jewel-encrusted coach was a gift from Jim Frecklington (who also built the Australian State Coach) and the Australian people, to the Queen on the occasion of her 80th birthday. The door handles feature 130 sapphires and 24 diamonds. It is also a traveling time capsule of sorts as it contains material from Britain’s historic buildings, ships and other artifacts that were incorporated into its construction. I myself would like to take a ride in the Gold State Coach. It was built in 1762 by the London workshop of Samuel Butler for the coronation of George IV. The coach has been used in the coronation ceremony of every subsequent British monarch, some jubilees, and a few royal weddings. There are three cherubs on the roof (which represent England, Ireland and Scotland) and four Tritons (Greek Gods) at each corner to represent Britain’s imperial power. The panels and doors of the coach feature artwork painted by Giovanni Cipriani. We will probably not see the gilded coach at Prince Harry’s upcoming wedding. It weighs four tons, is hard to maneuver, and is delicate due to its advanced age. I also imagine that once again the royal family will want to downplay any excess. 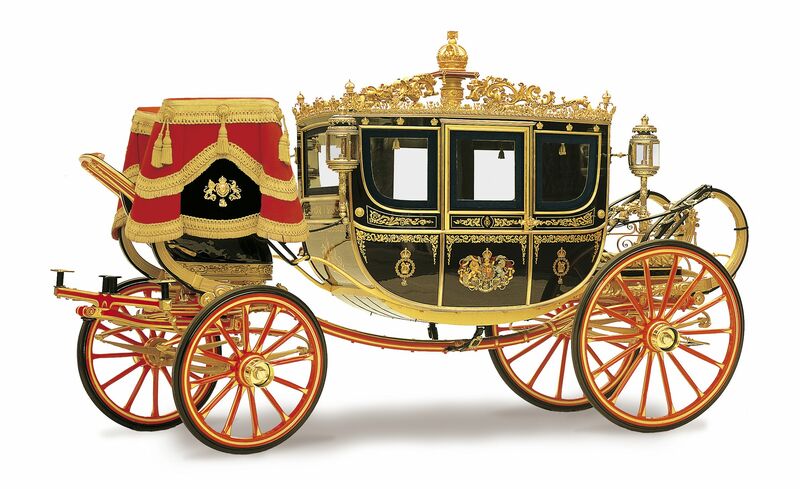 The coach will more than likely remain at the Royal Mews (Buckingham Palace’s stables) where it is on display to the public. Her Majesty, the Queen, will probably once again arrive by car and leave in the Diamond Jubilee State Coach. As for the bridegroom, I have a suspicion he and his bride will follow in the footsteps of his brother, Prince William and his bride, the Duchess of Cambridge. Prince Harry will choose to leave the church, with Megan, in the same carriage his parents used at their wedding. 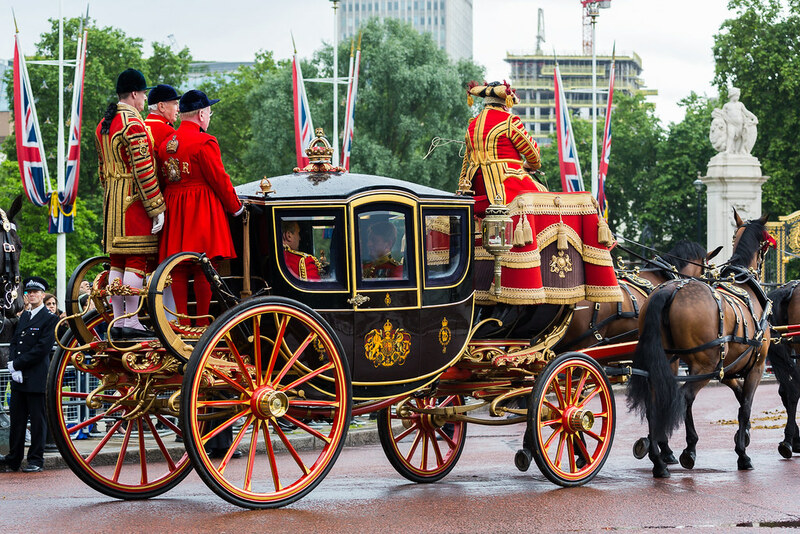 The 1902 State Landau carriage was built for King Edward VII’s coronation. In the event of rain, the Glass Coach will probably be used by the couple. It was built in 1881 and was purchased for use at King George V’s Coronation in 1911. It is similar in look to the Queen’s Australian State Coach and the Diamond Jubilee State Coach but does not have modern conveniences or elaborate gilded embellishments on the roof. The Glass Coach also has historical significance for Prince Harry as it carried his mother, Lady Diana Spencer, to her wedding in 1981. 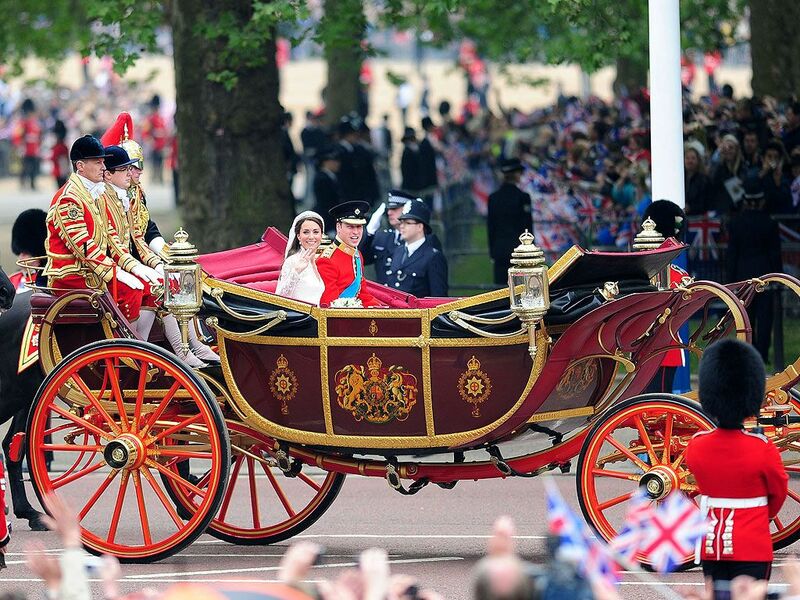 Indeed the coach has carried many Royal brides to their big days. Lady Elizabeth Bowes-Lyon in 1923 (the Queen mum), Princess Alexandra in 1963 (first cousin of the Queen), Princess Anne in 1973 (daughter of the Queen), and Miss Sarah Ferguson in 1986 (former daughter in law of the Queen). It has also carried many brides and bridegrooms from the church such as when Princess Elizabeth married The Duke of Edinburgh and again when Princess Anne married Captain Mark Phillips. There is also the Irish State Coach built in 1851 by John Hutton & Sons of Dublin. It was a favorite of Queen Victoria’s. 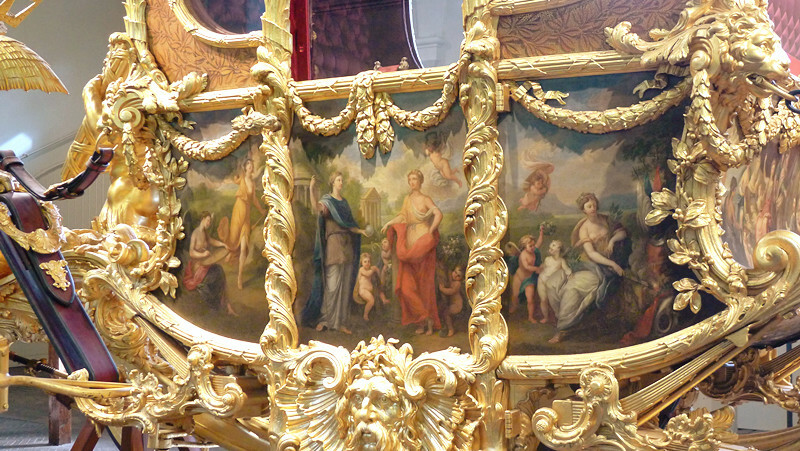 There are a total of five Semi-State Landaus at the Royal Mews. Prince Charles rode in one with the bride’s parents at William’s wedding. Other immediate family members will also leave the church in one of the five Semi-State Landaus. They generally have the coat of arms of a particular family member riding in the Landau. More subdued Ascot Landau Carriages will carry the remaining wedding party. There are a total of five of the Ascot Landau Carriages used for such processions. Other enclosed coaches kept at the Royal Mews include the Scottish State Coach. It was built in 1830 for Prince Adolphus, Duke of Cambridge. Later on, it was sold to William Coutts Keppel, 7th Earl of Albemarle. In 1920 it was returned to the royal family when it was presented as a gift to Queen Mary by the Keppel family. I hope to someday visit the Royal Mews. How about you, do you like a coach, carriage or car? Car. The cars are beautiful, they are safer, easier to secure, and, while I appreciate tradition, there's something to be said for some modern advancement in the monarchy! Oh I love this post! You did so much research. I love Kate. I am just like everyone in England. I am hoping beyond hope that they are happy. They really seem to be so considerate of their country and the state of the economy. When we got married we drove my Boxter. Now I have my little Cooper, which I would totally use in a wedding! But I have to say …The carriage is all about fairytale. Classic! See you tomorrow? I adored all of those photos of the coaches. Aren't they just magnficent, and oh, how I love the Queen! I was thinking that she is sort of like “our” queen, too, since she has reigned throughout our lives, and in my opinion, she has never stepped a foot out of line. Love her! Looking at the engagement pictures of Kate and Wills versus Charles and Di, I can see a marked difference in the body language. It might be because Prince Charles is so proper, and William is much younger, but look how William is leaning into Kate. He clearly adores her, and I think that will bode well for the success of their marriage. She also seems to love him. So I'm happy for both of them. I have a feeling his mother would be very, very happy! I was thinking about the decision to take a car to the wedding, and I wonder if William and Kate decided to opt for a car, not only for cost sake and “the people's” sake, but for safety's sake. Prince Charles and Camilla were attacked in the Queen's Rolls Royce by student protesters recently which was horrifying, and it could well be that the security risk in using the coaches right now might be high. I hate to think of things like that, but it could have factored into their decision as well. Another reason could be the fact that Diana's dress was crushed due the smallness of the carriage in which she arrived. The dressmakers were shocked when they saw how wrinkled it was from being “smished” in there, but it was still breathtaking. But the carriage was awfully small for a large poofy wedding dress. Something tells me that Kate's will be less poofy, but one never knows. However they arrive, I can't wait to see the dress. I wonder what it will look like. I'm willing to wager it won't be strapless. I hate that current trend. I think brides should look romantic. Bunny Williams said in an interview I heard that she hated it, too. I thought it might just be me since every wedding I've been to of late is a strapless one. It just seems so inappropriate in church. I'm old fashioned that way. LOL! Wow, I absolutely had no idea about all of these things and am happy just to know the difference now between carriage and coach. They are remarkable. I like the idea of the one made from different buildings in England and so forth. I don't even remember what I went to the church in but I do remember we left the church in my Dad's jag, sadly we have to give it back after the reception! 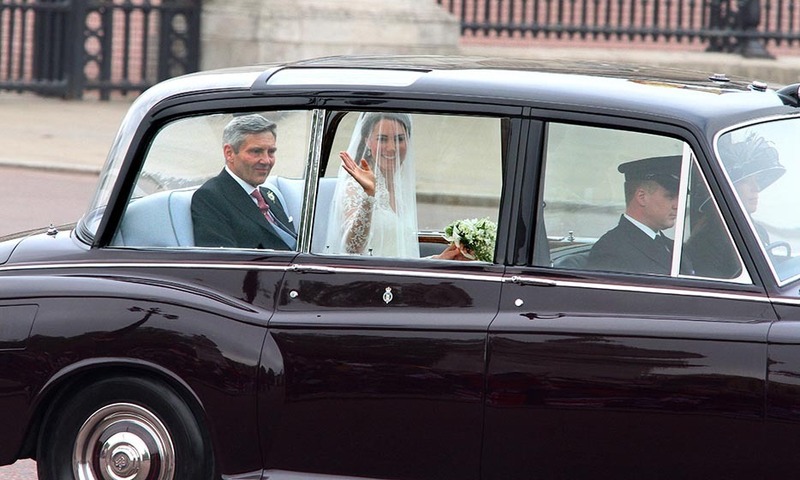 I think Kate was perfect in choosing the car – that way, we – Royal Fans – will manage to drool over her dress, hair, tiara, veil in her way to the Church. Poor Lady Diana was this lovely pin head among a white sea of frocks and silks LOL. Picturewise – great choice. Leaving a car – any of those cars – is so more elegant and “flowing” than entering and leaving a carriage: you are mostly pushed to enter, then everyone proceeds putting all those silks and frocks inside with you – pull here push there and when leaving the proccess happens again – let's push here pull there to compose what was running when entering. Fashionwise – perfect choice. And you do arrive a Cinderella and leave a Princess. Fairytale – PERFECT choice. Looking forward to know your blog better. I repeat….I am so loving these posts on Wednesday! I actually had a friend who arrived at the church in a horse drawn carriage-in Massachusetts, not England. Very romantic. As for me, I waited a long time to find my true love and get married–so we had exactly what we wanted–A white limo! Maybe cliche, but we loved it! Oh, very interesting. I don't know if I have ever seen the cherub coach. That is so extravagant. You spoke of Princess Grace, my husband and I booked a cruise around the Hawaiian Islands for our honeymoon. When we got there and boarded our cruise we were surprised to learn that it was the same ship that took Princess Grace across the Atlantic to Monaco for her wedding. They had a room on the ship devoted to her. It was 20 years ago and this ship was getting old, a lot of Carnival cruise people were very disappointed how old the ship was and it wasn't all modern and fancy, but my husband and I loved the history in it. Fun facts Laura! Fantastic post! Thanks for sharing all the lovely photos and all the information on the various cars, carriages and coaches (I was so excited that I actually knew the difference between a coach and carriage-too many Regency romances, perhaps?). If I were choosing a car to arrive in it would absolutely be the Rolls. That's a royal car. I'm hoping they leave in the same carriage as Charles and Diana because it is so gorgeous. BTW, I find the differences in the engagement photos very telling. Charles is very straight and proper and barely touching Diana and Diana is practically trying to pull him towards her. Will and Kate are very wrapped up in each other. Wednesday could become my new favorite bloggy day of the week! 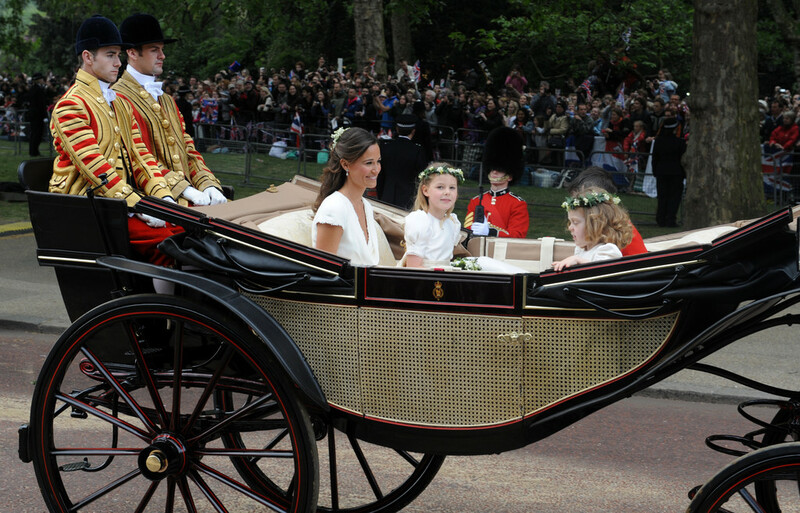 I'm so old fashioned in that I just love the carriage but when I first heard that Kate would be arriving in a car…my thoughts were if it were my daugher (who is 22) she would do the same. 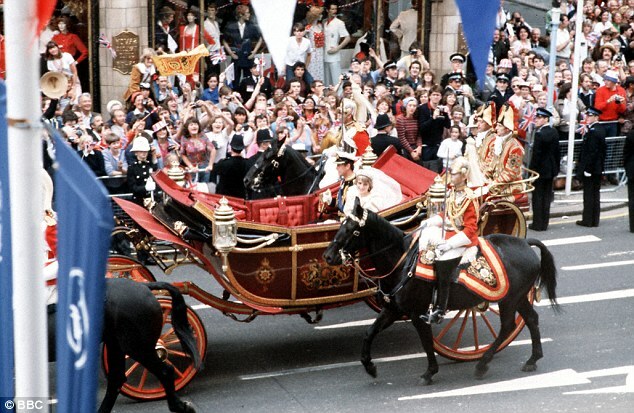 I think it is a way of showing that they would like to “bring some modern ideas” into the Royal Family and the fact that they are leaving in a carriage shows that they will be keeping tradition alive and well. Thank you!!! I will keep up with the wedding through YOUR blog! Forget all other news and resources! YOURS will be the BEST!! I love it! Amazing post – and great photos you found! It's so interesting to see how others live across the pond. My husband and I were at the Highland Games in Braemar in Scotland, August 2009. The queen arrived and it was quite the production! I'll always remember she wore this bright yellow canary hat. Thanks for sharing all your finds! A post both lovely and informative. Just wonderful! Coach, carriage or ca, this is one wedding to watch! What a lovely post! I know I will be checking in with you on Wednesdays! I have watched–since I taped it 2 or 3 times the royal weddings special from the History or Learning channel, now I forget!! !I love it all, going to Europe this summer, hoped to go to the wedding—well sit on a sidewalk for days, but when date was selected, April I cannot do, so June it is!! !MONACO is a STOP for sure!!! !Cruising for 7 or 9 days(I forget) then touring around for 7 days!! I like that she will arrive by car, I bet it is the same car as Sophie arrived in, by the way, I really like her!! !She has maintained her privacy for years!!! I hope they ride in an open carriage, I was thinking it might be a closed one due to colder weather in April. Hi Laura, I just love your blog. I am an English Royalist and proud of it. I am so looking forward to the Royal Wedding and thoroughly enjoyed your post on royal wedding transport. One small correction however if you will forgive me. The Queen is referred to as Her Majesty (HM) and the royal prnces and princesses as Royal Highnesses. Technically when Kate is married she will become Princess William of Wales however I guess that Prince William will want to modernise and she will be referred to as HRH Princess Catherine of Wales. It is all sooo exciting! Having had the opportunity to see the infamous gold coach at the Royal Mews, my forever and always vote is for the GOLD COACH. As a matter of fact, if I were the queen, I'd have those streets blocked off every single day, just so I could cruise around in it!! Yes, yes, yes–I would. I would probably then suffer the same fate as our beloved Marie Antoinette–not only for the traffic snarls, but for the sheer spectacle 24/7. P.S. We need that play set. A huge RWW greetings to you! Will enjoy your spin on things as the weeks go by. My thanks to Mamma Hamilton (my beloved mother, Nadine was a Hamilton) for pointing out my faux pas. The Queen should be addressed as Her Majesty and not Her Royal Highness. I love the idea of her arrival in a car, as a commoner, and leaving in a carriage; it will all be such fun to see, I can't wait…and I can't belived the generosity of the Australian people for those coaches. I always think of the movie The Queen and the line “it's Ma'am as in Ham” which I think is shortened from Madame (=Ma'am) is it? There can never be a more exciting wedding than that of Princess Di..But, I'm so excited for Prince William..To answer your question I would select arriving in a horse drawn carriage..after all..how often does one marry a Prince in real life? I agree with one other blogger who said that we will just keep up with all the royal happenings via your blog 🙂 Very interesting 🙂 I think my choice would be carriage… every little girls dream. Such wonderful images of the Royal Lifestyle. Oh my ….we love to enjoy seeing the latest news always!! I'll be in the same carriage with you. I love this series. Thanks for bringing us all the details! I would have to choose one of those glorious coaches! Loved all the interesting details of this post. This is lovely to read. Honestly, I haven't followed any of it, but still think it's beautiful and interesting. Laura, I panicked earlier today when I realized it was Thursday and I had missed RWW. Thank God Save the Queen that it was still up and I could enjoy it fully a day late. Since you asked… I think Kate should arrive in an enclosed car (I can lend her my Vibe, if she'd like) and then leave in an open vehicle or carriage. I would like to see them in a different carriage than the one Will's parents left in. Maybe a quick escape via motorbike, perhaps? No, too windblown and The People want to see the new couple so horse drawn carriage seems best to me. Laura, you're funny. Just popped over to say sounds great – I'm in! Lovely Post Laura, I really enjoyed it and I look forward to more!Are those little figures like the weeble people toys or do they belong to the loving family dollhouse group? Serious, are these just in England? They are pretty darn cute and I would like to have some. Hope to see you soon! May I just come in my '67 Spitfire? So enjoyed your write, Laura … you are just beautiful in every way. Have a grand time at the show & hope the weather is good for you, sweetie. What a fascinating post Laura. Very informative, and creative. What a fun post! I love this series, Laura! As you might expect (and probably did yourself) I watched “The Coronation” on Smithsonian channel this week. I hope you saw it — if you didn’t, it’s on demand. I loved how the Queen was talking about how uncomfortable the coronation carriage was! Wonderful footage, much I’d not seen before and I’d seen a lot. Une superbe publication accompagnée de nombreuses photos… Merci pour le partage. 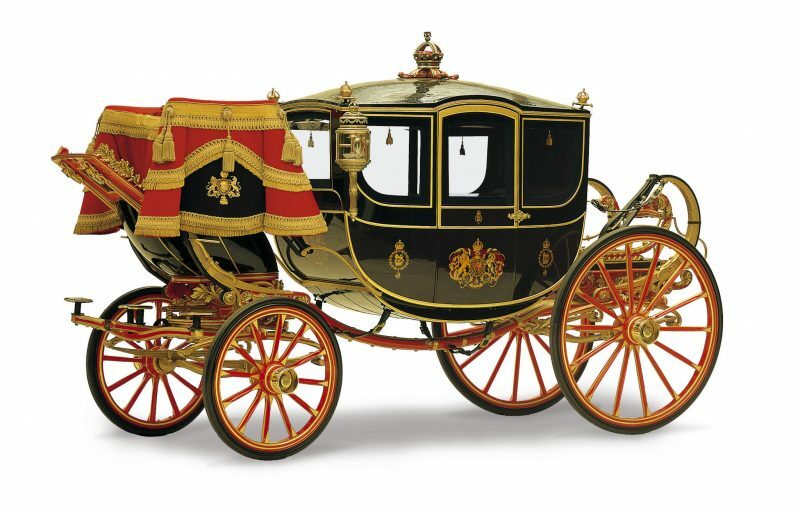 Lovely post with info and history of the royal transportation. I would love to ride in a carriage. Every girl’s dream right? I watched Princess Di and Charles’ wedding and Prince William and Kate’s. I can’t wait to watch this one as well. Such a cute couple Harry and Megan. 🙂 We have all watched those boys (Prince’s) grow up and mourned for them when their Mum tragically died. So wonderful to see them as grown men getting married and having families of their own. Fun and interesting, I’ve just watched The Crown so this really spoke to me. I’m behind on my reading, but I wanted to wait until I had time to really enjoy this post and I truly did! 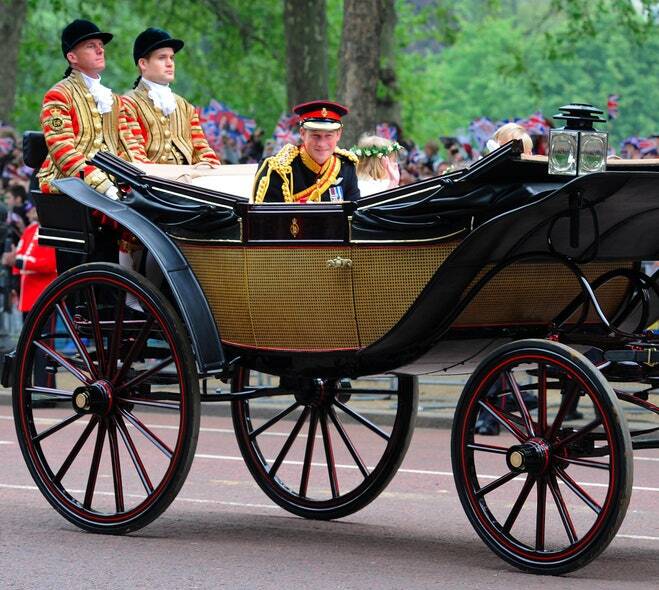 I love the royal family, but I really didn’t know anything about coaches, carriages, etc. Thank you for the wonderful and informative post! I can’t wait for the next two royal weddings and for you great posts!